This was the inaugural flight of the all-business class A319 from London Heathrow Terminal 4 to Doha International Airport. The new “Business One” service is Qatar Airways’ sixth and final flight of its daily roster, departing on this summer schedule at 2155 and arriving into Doha the next morning at 0640, and leaving Doha on QR15 at 1450 to reach Heathrow T4 at 2025. The new additional flight will step up the frequency on the Doha to London Heathrow route from 35 to 42 weekly services and comes just before Qatar Airways commences operations on the Doha to London Heathrow route with its new A380 aircraft, which will operate on QR003 and QR004 from June 17. I’ve heard various explanations of why Qatar is using a narrow-body all-business class aircraft on a valuable slot out of Heathrow — everything from holding the slot ready for a new wide-body aircraft delivery to the fact that it actually is a narrow body slot at Heathrow (ie: not one which could be operated by a wide-bodied jet). There was also the story that initially the slot was to be bought from Cyprus Airways, but when this was leaked to the press the slot was instead bought from IAG and is an ex-BMI slot. I will ask the CEO when I get the chance in a few days’ time. To read previous news stories on this click here, and to read our forum thread on it, click here. 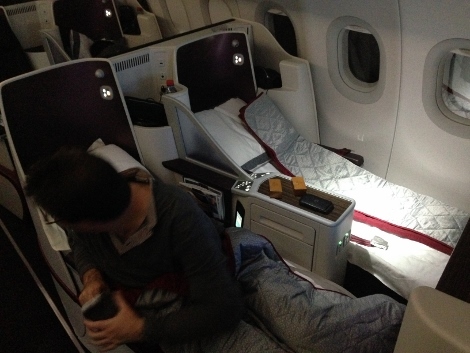 To see the description on Qatar Airways website, including a promotion for double QMiles, click here. I arrived at Heathrow T4 at 1915 for the 2155 departure on QR16. I checked in a couple of bags and then used fast-track security to go airside, which took less than five minutes. 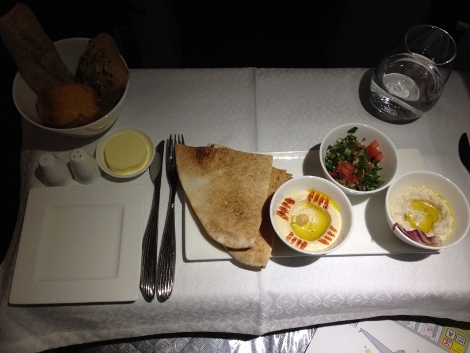 From there, I turned left and walked to the Qatar Airways lounge. As this was the inaugural flight, the lounge was mostly taken over with VIPs and corporate clients, so it’s not really the place to review the lounge, although this is a lovely area with its own restaurant, showers, seating areas and a floor-to-ceiling window looking down onto the tarmac. (You can see pictures of the lounge here.) There were special food offerings, including Krug Champagne, caviar and chefs behind the bar preparing various treats. We had a brief welcome speech from Richard Oliver, UK and Ireland country manager for Qatar Airways, and then the aircraft arrived on its journey from Doha and parked in view. There were then some guided tours before we boarded. Boarding takes place via an air bridge next to the lounge, and was completed quickly (the flight was about three-quarters full, although about ten people were media representatives). The aircraft is configured in one cabin and because of the over-wing exits it naturally splits into two with five rows of 2-2 seating (AC-DF). 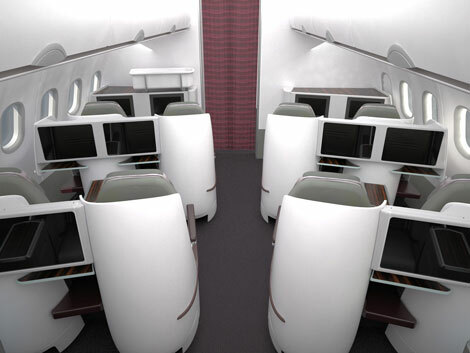 The design is clever — while in many ways it resembles a standard fully-flat business class seat, the smaller cabin has been accommodated, by lowering the backs of the chairs and the general profile of the seats, so that the cabin still appears spacious. When you sit down you have a clear line of sight down the cabin, so there’s no sense of claustrophobia. At the same time, this ability to feel as though the cabin is open doesn’t mean you are invading the privacy of others (or having your own privacy invaded). 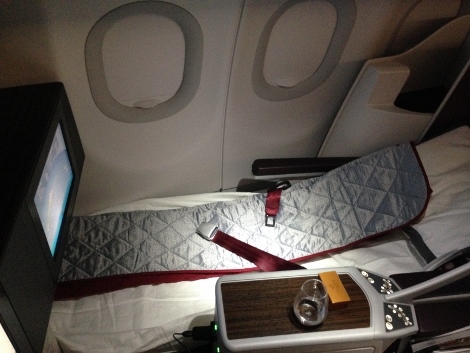 The raked angle of the seats towards the window means if you want to talk to another passenger or look their way, you have to make an effort to do so — no accidental meeting of eyes, presumably a big part of why people would want to fly this A319 all-business class instead of one of Qatar’s existing wide-bodied flights with its fully-flat business class. The colour scheme of the cabin is neutral, with the normal deep purple darkened slightly, giving the interior very much the feel of a restrained business jet. The dark leather seats have white stitching and look elegant. 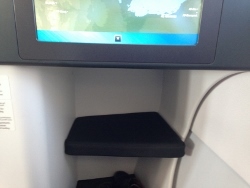 There are laptop power sockets between each seat and, to one side over your shoulder, there is a small storage compartment for a bottle and perhaps some books or personal items. 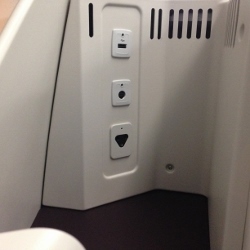 This is where there is also the socket for the noise-cancelling headphones, a USB socket and a DIN socket. The Oryx inflight entertainment system is top class, with the ability to be able to watch one thing on the touch screen handset and another on the main screen. This takes some getting used to, but is similar to that on the B777 fleet. The flight was also equipped with OnAir mobile services allowing SMS mobile texting via the GSM and GPRS service on board, although there is no wifi. I was in the rear half of the aircraft. As row five was free, I moved from my 8F seat to 5F so I could work without disturbing anyone, since I knew that several passengers would want to go to sleep more quickly than I was planning to. A Salvatore Ferragamo washbag with Attimo pour home products inside was waiting on the seat, as it is in Qatar’s standard business class. There was also a bag with non-slip flight socks, eye mask and ear plugs, as well as a small bottle of still water. There was also a duvet and large pillow and, on request, a sleep suit, although only size XL was available. If you like window seats and want a view, then go for the front of the first cabin, since obviously this is infront of the wing and you will get a view, whereas all the seats at the back have either a total or partially-obscured view. There is a washroom at the front and two at the back. The one at the front is quite tight if you want to get changed in there, but there’s nothing stopping you from walking to the back to use one of the two larger washrooms for changing. In the back cabin I think row five is a good option. There is nobody in front of you and the emergency exit gives you both a sense of spaciousness and also the reality of it, since the alcove for your feet is wider in both this row and row one (see pictures of this, below). Beyond that, it’s a choice of whether you go for a window seat or an aisle seat, and as always that is personal preference. There seemed to be no shortage of storage space for bags, but many of the passengers had checked bags. If you are taking everything on board, probably avoid seat 8A and 8C, since the overhead compartment here was blocked off, perhaps for emergency equipment. Next to the emergency exit are a couple of narrow wardrobes where our jackets were hung (and later trousers and shirt when I changed into a sleep suit). Each seat is angled slightly towards the window, which gives a little more privacy, although the configuration of 2-2 means you do have the problem of stepping over the passenger beside you when the seat is fully reclined. As with most flat-bed seats, the seat reclines to meet a footrest / ottoman, which in this case is tucked into the seat in front. The IFE touch screen is a good size (I’m waiting for exact measurements). It doesn’t need to be too large because it is within easy reach when you are sitting up. The table folds out from the arm of the seat and suffers from the problem that many of these tables have in that it bounces slightly if you try working on it with a laptop. It was, however, firm enough for dining. I just stuffed the blanket between the arm of the seat and the underneath of the table so it acted as a support and carried on working. Once we sitting we were offered a choice of drinks (Champagne, water, juices) and then the safety video was shown on the touch screen IFE system. The pilot told us the flight time would be six hours and fifty minutes, and the aircraft then pushed back and began the short taxi for take-off. After a very smooth climb to cruising altitude, the flight remained relatively smooth. However, half-an-hour after take-off there was some mild turbulence which delayed the drinks service slightly. But for the rest of the flight it was the same as being on a wide-bodied jet, although this presumably will differ from flight to flight. The staff were excellent, as you might expect when there are six in total, including two working as chefs. 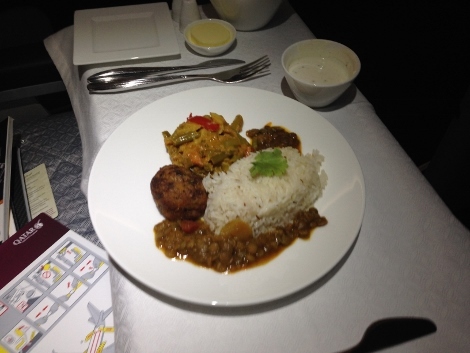 Almost immediately, as the meal service was ending, those who hadn’t already fallen asleep requested the turndown service and the seat was reclined and a mattress spread over it, then the pillow placed, duvet spread out and seatbelt made ready for you to buckle up once lying down. I had a cup of camomile tea, and then got comfortable. A few observations. 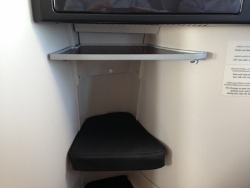 The seat is quite narrow, both where your feet are in the alcove and at the shoulders. As far as feet are concerned, the bulkhead rows (one and five) have much larger alcoves because there is no restriction from the seat in front, so another reason for choosing those rows. Around the shoulders, just make sure the arm rest is down since this gives a bit more room, but it is still quite tight. There is also a large head rest which is comfortable when you are sitting up, but has the effect if pushing you slightly down in the seat when you are lying down. You have to make sure to push yourself up to take advantage of the whole seat. It also can be difficult to get in and out of the window seat if the person inside you is fully reclined. There is space to first put one foot then another before twisting and lowering yourself into the seat / bed, but it’s not an easy manoeuvre whether you are the one trying to complete it at night or having it performed above you. That said, I slept very well, waking three hours later (although I could have slept longer) to take advantage of the Continental breakfast and continue writing this review. For breakfast I had some sliced fruit, a smoothie and then a couple of coffees which were lovely. There are 11 different types of teas and six coffees — Americano, cappuccino, decaffeinated, espresso, latte, macchiato — on offer. We arrived in Doha International Airport on time and were then bussed to immigration, where after a five-minute wait we passed through and onto the baggage carousel, where our luggage had already been off-loaded. Very impressive. 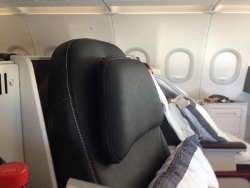 As several people said on the flight, they wished it was longer so they could have enjoyed the bed and got more sleep, but then that applies to the normal wide-bodied business class on this route as well. The advantage of this over standard business class is a quicker boarding time and quicker getting off at the other end, and perhaps more personal attention from the staff, although it’s pretty impressive on the wide-bodied fleet in any case. 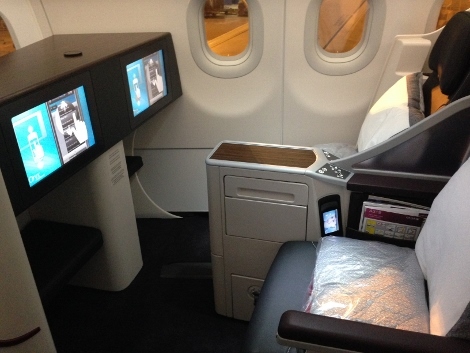 The seat is smaller than the normal business class, and larger flyers might feel a little cramped. But otherwise it’s an excellent addition to the service, and with six daily flights with Qatar and then all those onward connections it’s to be recommended. And then, of course, there’s the new Hamad International Airport that Qatar will move to later this month (see news, May 12). Definitely worth trying.